Recent release “Ozbert” from Page Publishing author Mahlon Bryant is both entertaining and thrilling; it is a page-turner that keeps the reader mesmerized. 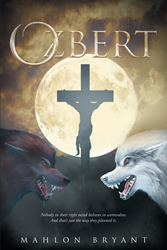 Mahlon Bryant, a science fiction fan, devoted writer and author, has completed his new book “Ozbert”: a gripping and potent journey of monsters, tragedy, vengeance and mystery with several unexpected moments. Published by New York City-based Page Publishing, Mahlon Bryant’s imaginative work is the perfect read for any science fiction fan! For 20 years, Brion Hall had lived the life of a functional addict. When the prescription pain meds are suddenly taken off the market, he decides to enter a detox program and with the help of his family and friends is finally looking forward to a drug free life. But strange recurring nightmares and bizarre physical changes presage a Halloween that will tragically alter his families’ lives and reveal a previously unknown birthright that will change his perception of reality and plunge him into an age’s old battle that could affect the course of all life on the planet. It begins after the traditional festivities of Halloween. As he drives his children up to his parents’ house, he is carjacked and brutally beaten. The attack and fear for his children's safety trigger a previously unknown and drug suppressed ability to transform into an 8 foot tall, 750lbs nearly mindless engine of destruction; a werewolf. Slaughtering his attackers, the beast runs off into the night. Brion is found the next morning by two members from a hidden race that call themselves Shifters and offer Brion a way to learn to control his own beast. Brion finds himself in the middle of a battle between one faction of Shifters that want to keep their race a secret and one that wants to reveal themselves to humanity. As the arguments reach a fevered pitch, Brion is forced to return to his hometown to investigate reports of a Shifter that may be his youngest son. What he finds will test his loyalties and pit him against every Shifter on the planet; all 250,000 of them. Readers who wish to experience this mesmerizing work can purchase“Ozbert” at bookstores everywhere, or online at the Apple iTunes store, Amazon, Google Play or Barnes and Noble.